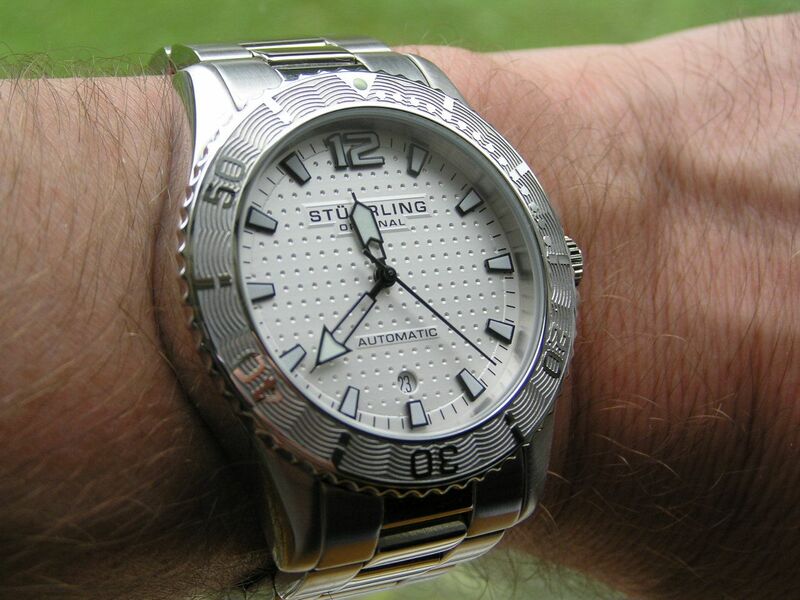 This is the third Stührling Original brand watch I have purchased and unlike the Stührling World Time GMT I bought, this one lives up to the expectations created with my first Stührling purchase, the Tuskegee Flier. Both of these watches have been reviewed on this blog. 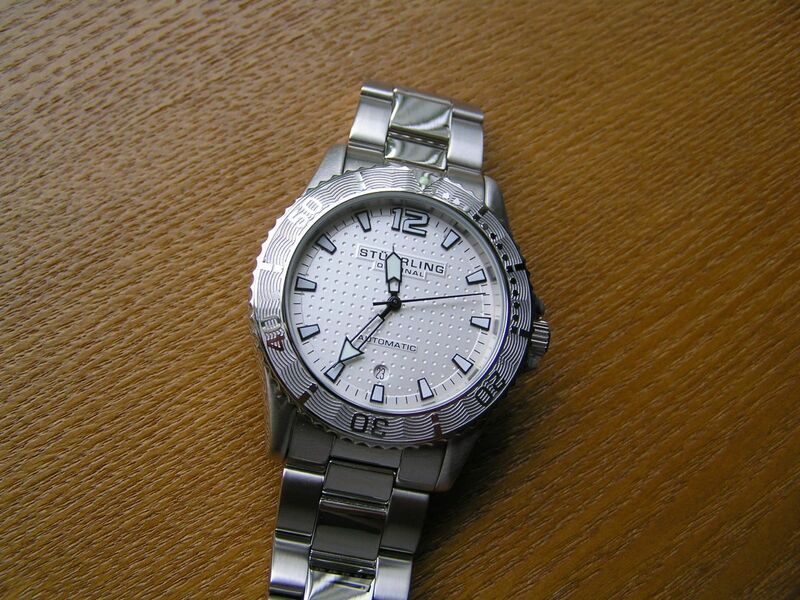 This is the Water Sports Regatta Automatic Diver, Model # 161.33112. 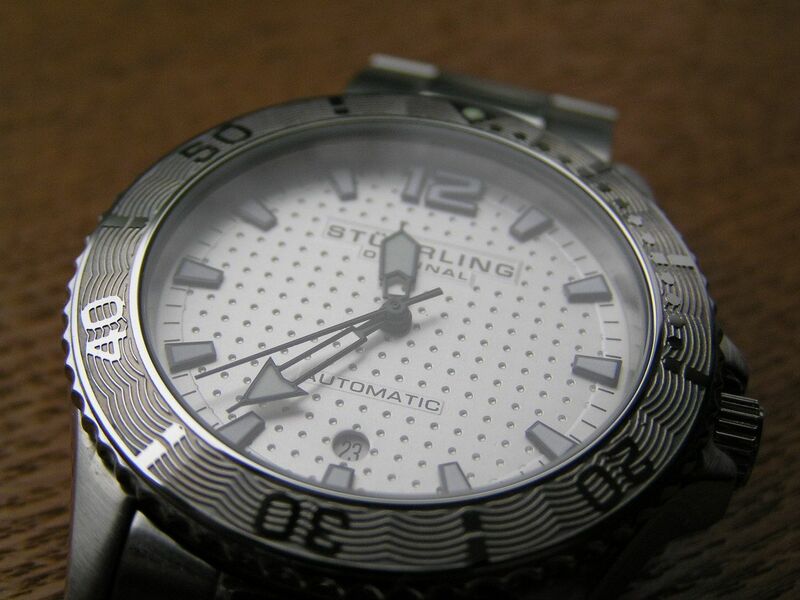 And despite the pictures you may see online, the dial is silver, not white. I originally was thinking it would be white, but was not disappointed to discover that silver is the actual color. This model also comes in a black dial. The quality control on this watch is fine, just like on the Tuskegee Flier. The GMT I ordered suffered from several QC issues and in total, after a while, they degraded the overall experience for me in owning that watch, so I sold it. So I’m batting two out of three with Stührling. The Regatta is appealing because of its classy looks, with sporting intentions and a clean, overall handsome design. The case is all stainless steel and is polished on the sides and brushed on the top, with the sides having a slight roundness to them. 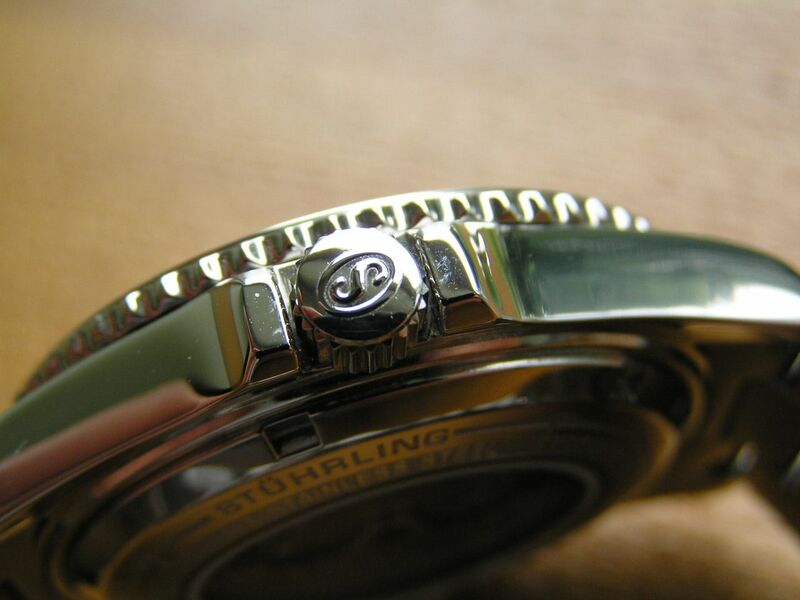 Diameter is 42mm without the signed screw down crown, 45.5mm with the crown. Thickness is 12.5mm, lug width is 22mm. Crown guards extend from the case to protect the crown. The case back is a display type that screws down, with nicely engraved printing around the edge. Watch is factory rated at 100 meters water resistance. 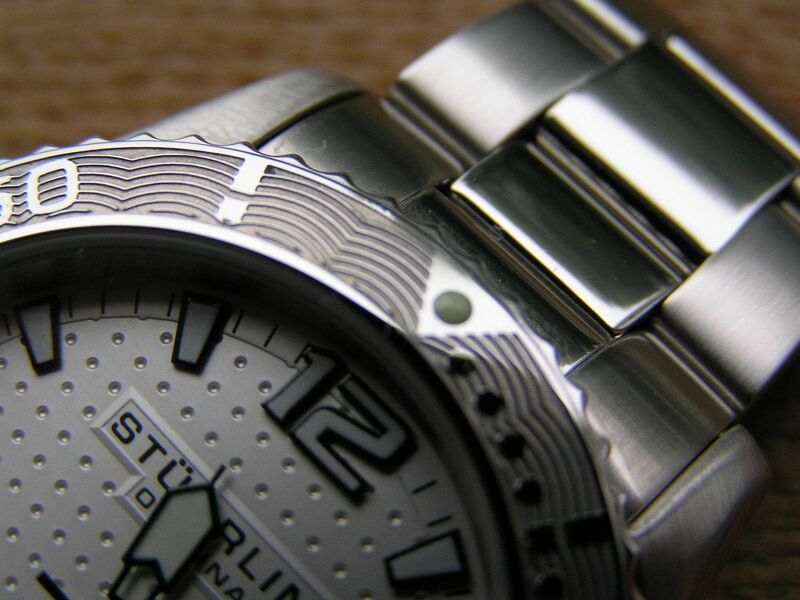 The design of the bezel, with its wavy engraving is somewhat unique and slightly Rolex Yachtmaster-esque in appearance or similar to a Ulysse Nardin Maxi Marine diver. I like the overall effect. The bezel is one of those odd 96 click varieties, unidirectional. A lume pip is located @ 12. 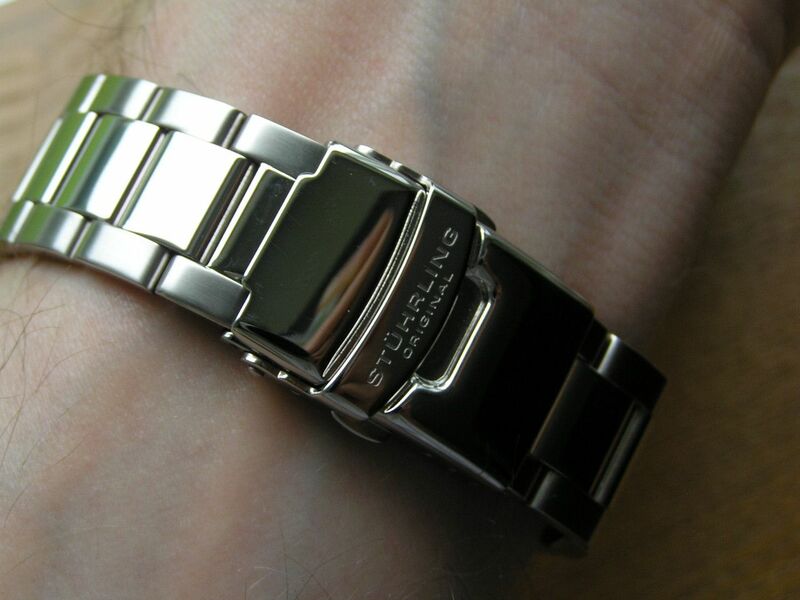 The only QC quibble is that the bezel alignment could be a tad better, maybe off by a third of a click, but since the bezel is all one color, this isn’t much of an issue, especially since it seems that too many watches these days (and many costing much more than this one did) seem to share the same affliction. 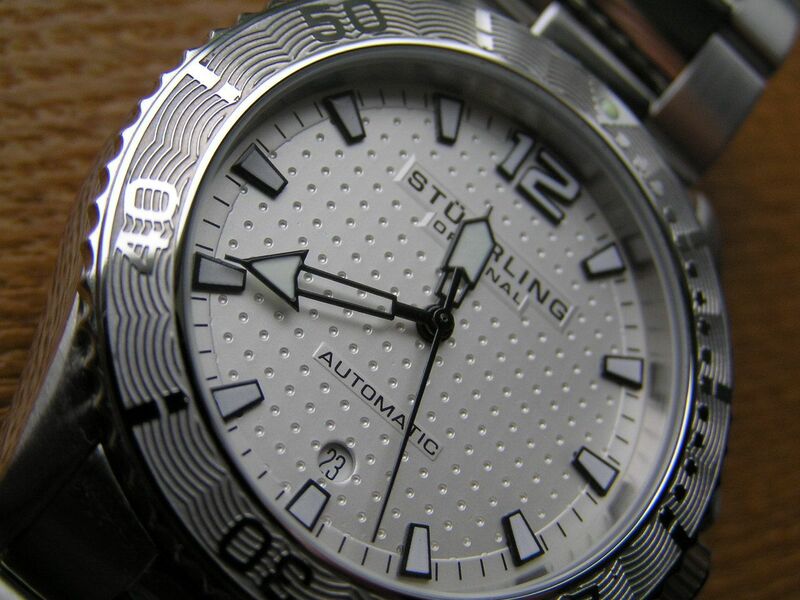 What I really love about this watch is the clean, easy-to-read dial. 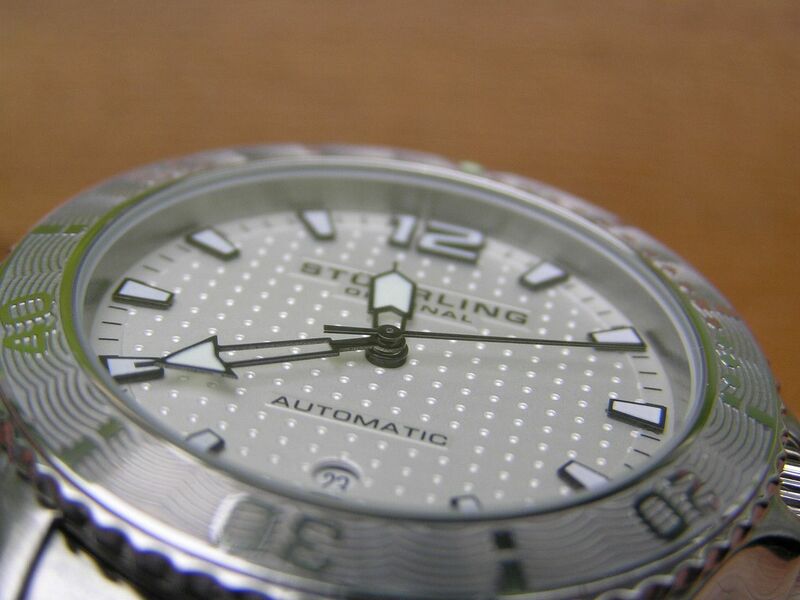 The dimpling effect on the dial (waffling? golf ball?) is subtle, yet nifty. The minimal text is great; I hate dials that have so much printing on them that they look cluttered and cheap. The markers and ‘12’ arabic are applied luminous outlined in black, as are the skeleton-style hands. The seconds hand is straight black with no lume. Regular readers will know that I’m generally not a fan of skeleton hands, but these are easy to read and to me, aren’t as open as some skeleton designs, so I can definitely live with them. 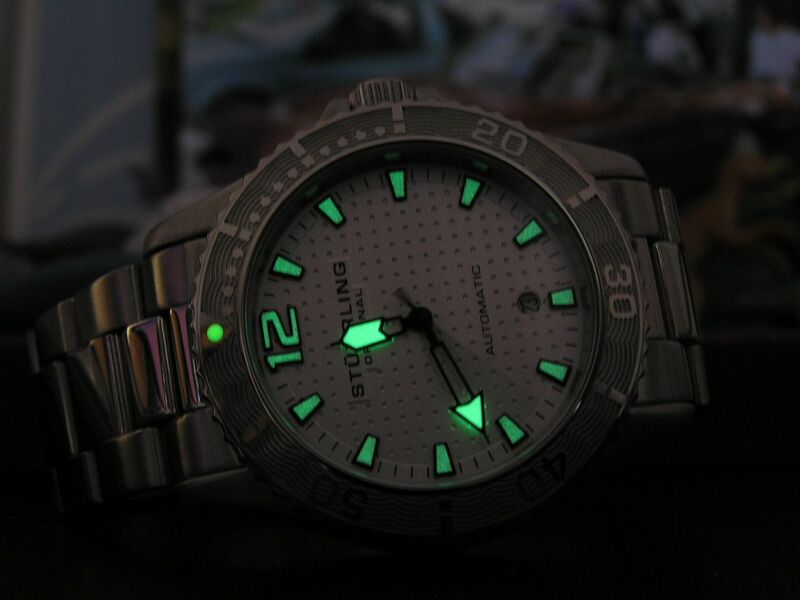 Lume quality is good and fairly evenly applied. A quickset date is located @ 6. This watch comes from the factory with a round cyclops over the date. Since I don’t like cyclops and although the round cyclops didn’t look too bad, I decided to remove it. Learning from my first experience, I purchased a 180 watt soldering gun and after a few seconds, the cyclops split in two and was removed in two pieces, watch intact, not disassembled, and working fine. 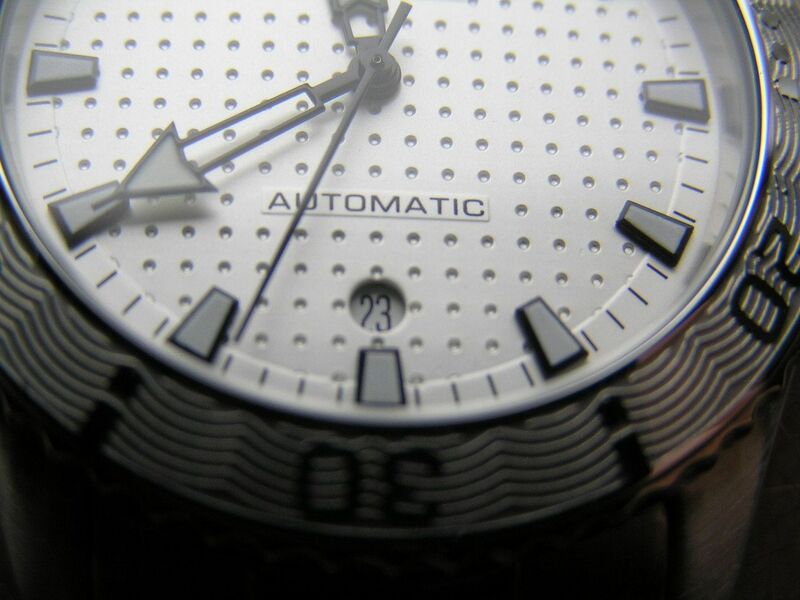 The date window is quite small without the cyclops, but the overall look of the watch is much better for its removal. 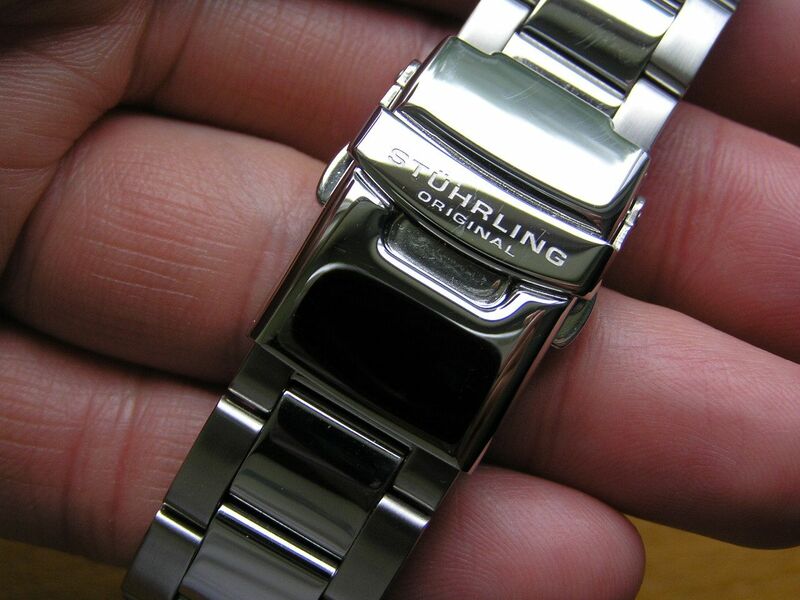 The crystal is Krysterna, which is Stührling’s variety of sapphire or sapphire coating. 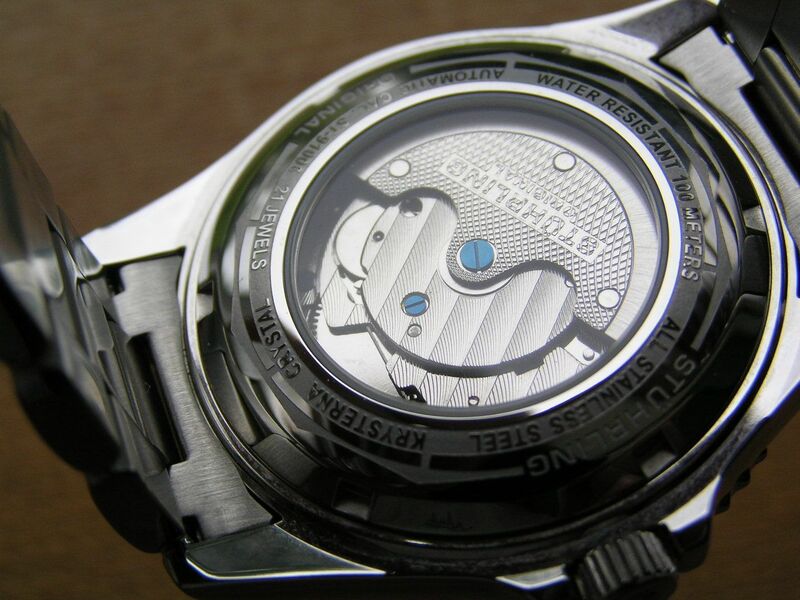 The automatic movement keeps decent time (around +20 seconds per day) and hacks and manual winds. One note, this is one of those movements that sometimes when you hack set it, the second hand will jump ahead a few seconds when the crown is pushed back in. 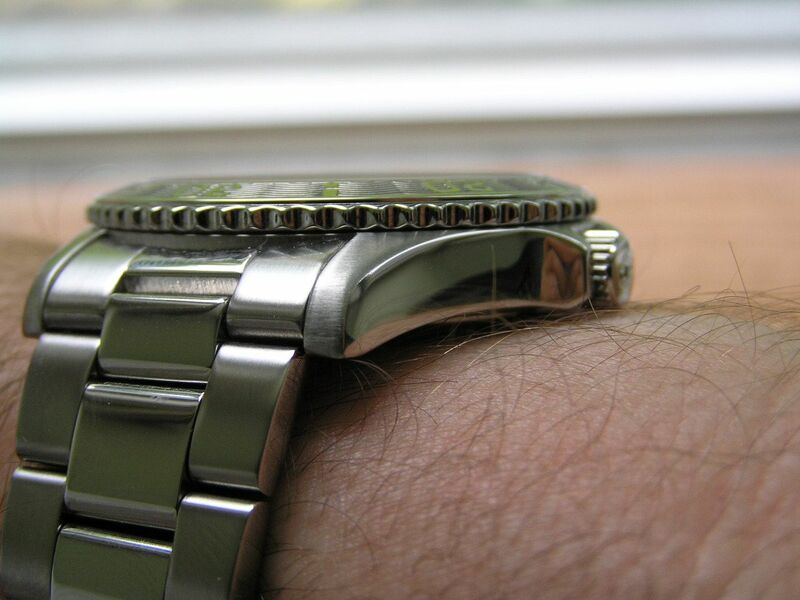 This can be annoying since it tends to defeat the whole idea of hack setting a watch. 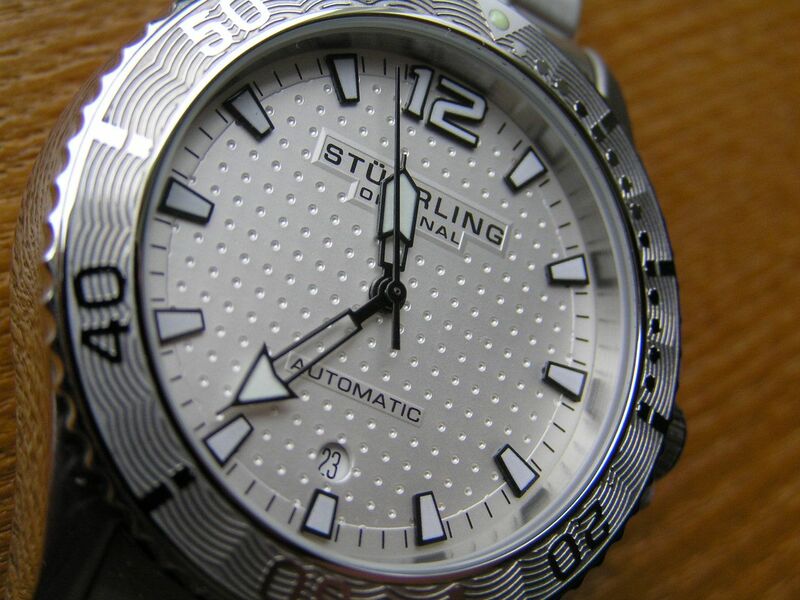 As seems to be the standard issue in Stührling watches, the Regatta hosts a Cal. ST-91006 21-jewel movement that is nicely decorated with blued screws, a ‘damier finished’ signed rotor and Geneva stripes, running at 21,600 vph. Power reserve is the claimed 38 hours or so. 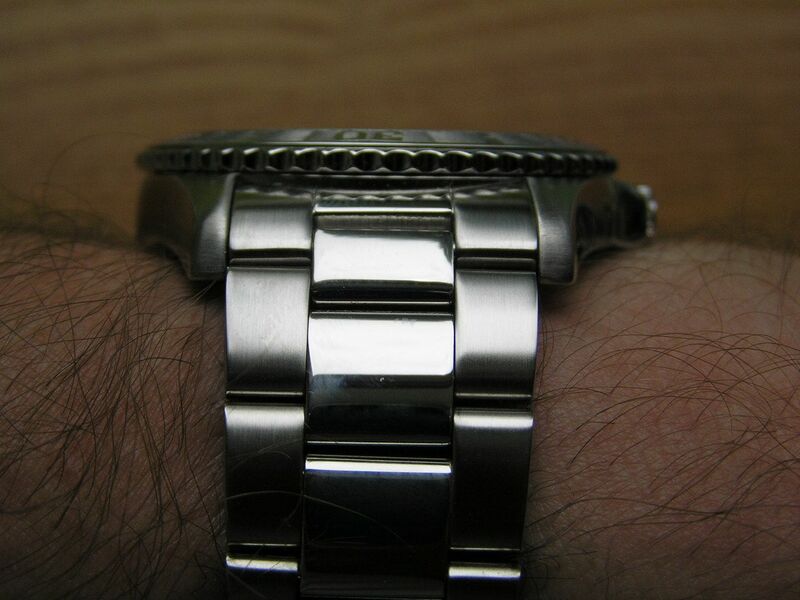 The bracelet is solid link stainless steel with solid end links and a standard stamped steel deployant. But Stührling did polish the deployant up so it doesn’t look as cheap as it could. The signed clasp is also fully polished (a bit blingy for my taste, but okay) and is a pushbutton double locking type, so that is fine. The bracelet has brushed outer links with polished edges and polished center links, held in place with standard split pins. It’s 22mm wide at the lugs, tapering to about 18mm at the clasp. 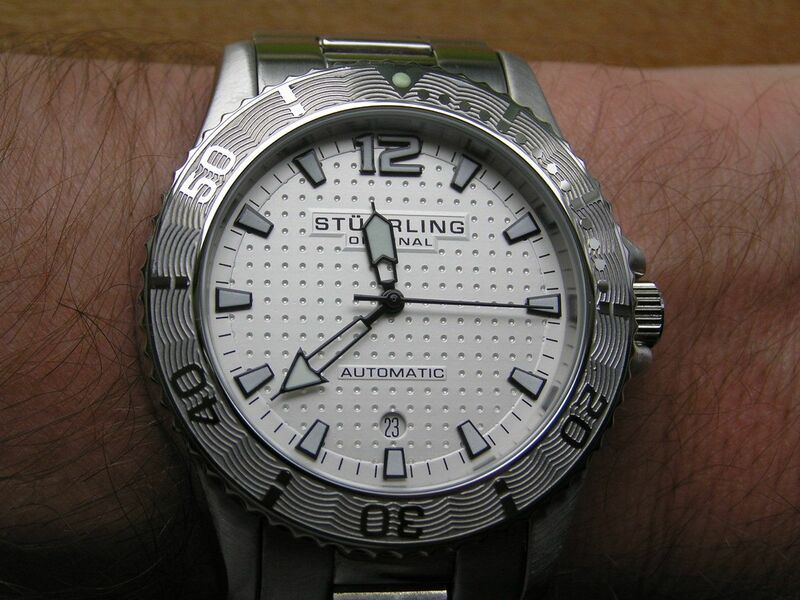 I tend to associate Stührling with Invicta, because both these brands have stupid fantasy retail prices and relatively cheap street prices. They also have similar feature sets for the money. 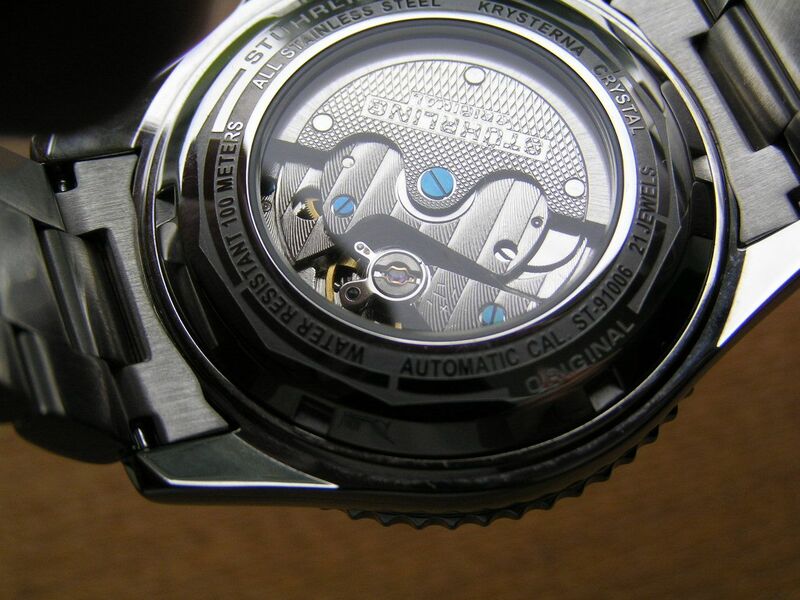 But when it comes to automatics, Invicta usually uses either the tried and true Miyota 8200 series (undecorated, does not hack) or the newer Seiko derived movement (basically undecorated, no hack or manual wind) whereas Stührling uses Chinese movements that hack and manual wind and are a pleasure to look at. IMHO, the scale tips in Stührling’s favor here with the exception of the hack setting difficulty mentioned earlier. Presentation is typical Stührling impressive, with a huge box, polishing cloth and associated paperwork. Street price for this Regatta diver is about $100 USD. For this price, it’s an impressive piece, with stunning good looks, a super clean dial layout and a reliable automatic movement. I sold this watch after owning it for about six months. I liked the watch as a whole and still think it represents an excellent value for its feature set. They now have an all-black IP model that looks superb.